Da Vinci Spin-Synthetics are a series of watercolour brushes with a very smooth texture. They are made of light brown synthetic fibres held in plastic quills with transparent lacquered handles. 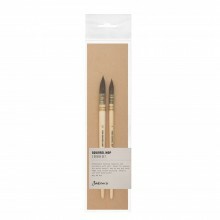 These brushes are well suited to use with liquid colours, especially for watercolour paint and silk paint. Da Vinci Cosmotop Spin Synthetic Fibres now available in traditional style quill brush. 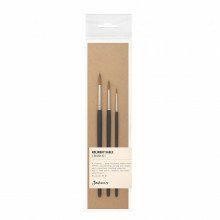 These brushes have an amazing snap and point for use with watercolour, gouache and inks. These brushes are exceptionally well made and contain the finest golden synthetic fibre. Compared to its fellow synthetics this brush range holds a remarkable amount of water. This unique Da Vinci brush is popular for its water-holding capacity and excellent value in large sizes. It is a blend of 5 different diameters of extra smooth synthetic hair. Da Vinci has built specialized machines that can sort synthetic hair in varying diameters. This sorted hair is then turned over to a master brushmaker who hand shapes the CosmoTop Spin. The thicker hair is placed on the outside and the thinner hair in the middle to ensure high colour-absorption while maintaining a fine point, stable shape, and energetic spring. Ergonomic transparent lacquered hexagonal handles allow for maximum painting control and seamless, nickel-plated brass ferrules are rust-resistant. The result is a revolutionary, durable, synthetic brush for artists.